A unique design brings a convenient feature that differentiates, howwever the low resolution display may disappoint. It's good value for money and despite specs that don't hit the all the high notes, it's a reasonable all-round performer. Dare to be different. That seems to be Lenovo's mantra as the company looks to deliver a "better way" of using an Android tablet. The company's answer? The Yoga Tablet 10. Shelve your thoughts of something really wacky, though, as the Yoga isn't that far removed from every other 10.1-inch tablet on the market. The name, however, tells us that this is a multi-mode device, able to sit in multiple positions just like the other Yoga products we've previously seen from Lenovo. But is this going to change your perception of tablets and is it truly better than the existing options out there? We've been flexing the Lenovo Yoga Tablet 10 through its paces to find out. Lenovo's differentiation with the Yoga Tablet is the inclusion of a stand. One side of the tablet has a rounded section like a tube or a teardrop, and that provides the basis of a grip as well as providing the hinge around which the stand can deploy. It's nicely integrated into the design, flowing smoothly from the flat display into this pronounced edge. Careful attention has been paid to the finish, so the majority of areas you touch are metal, around the barrel hinge and the edges of the display. It's simple and well implemented and the quality is high enough to feel like Lenovo has done it right. At first we thought it was all a little too obvious, but having lived with the Lenovo Yoga Tablet, we've come to like what it offers. And that, in a word, is flexibility. The design is supposed to reflect an open magazine and we first likened it to the 2011 Sony Tablet S, which was said to be inspired by a folded newspaper. That's certainly true, but here Lenovo has taken advantage of the design to make the display nice and thin, gently tapering off towards the far edge, rather than hanging on to the unnecessary bloat of Sony's old tablet design. The result is a device that weighs 610g. That's about the same weight as the Nexus 10, but Apple's 9.7-inch iPad Air is 469g, some 23 per cent lighter. Certainly, if you're after the lightest tablet around that that's not what you get with this Lenovo, but it's worth considering that the Yoga Tablet does things that other tablets would need a separate cover or stand for. We've mentioned the metal materials used on the stand and around the edges, but elsewhere the Yoga Tablet is plastic. The back is finished in textured silver plastic, which wraps around to the front of the device incorporating the speaker grills. It's a lightweight plastic and we found that we left an impression in one of the micro-drilled speaker grills when we pushed it with a thumbnail. Overall though, we're happy with the design and the finish. It's not flat, so won't slip into a bag as easily as some of the competition, but it does offer a more versatile deployment straight out of the box. We also like the power button on the end of the round edge. It's very much like the Apple Wireless Keyboard or Magic Trackpad in looks, in a positive way. Lenovo claims there are three modes of use for the Yoga Tablet: stand mode, tilt mode and hold mode. Hold mode seems to have worked out well: all the people we gave the Yoga Tablet to found it comfortable to hold in portrait, as if reading a book or magazine. Some gripped it directly on the edge, some passed a hand around the back to grip the edge, resting the body of the tablet across an arm. We've never had a problem gripping a flat profile tablet before, but for those who want something chunkier to grab on to, this certainly helps and it feels natural to hold in that fashion. Flip out the metal stand and you can stand the tablet up to watch movies, read instructions, display your photos or whatever you like. We fired up Nigella Lawson's American Breakfast Pancakes recipe and that's where we think the Yoga Tablet might find a natural home: standing on a kitchen worktop. Finally tilt mode is a by-product of the Yoga's rounded edge, as it raises the back of the tablet making it more comfortable for typing. You can either tilt it a little or a lot, depending on whether you have the stand out or not. It's worth pointing out that the Yoga Tablet's stand only props it up in landscape mode though. That's perfect for movies, but in many cases, being able to stand it up in portrait would get you more information on the display, especially for webpages or typical A4 documents. Alas, the angles of the ends won't allow for this. There's perhaps one downside to the design: in putting the weight towards one edge, it can feel top or bottom heavy when held in landscape. That means that for things like motion-controlled games, the Yoga Tablet doesn't really feel balanced. We gunned our engines for a session of Real Racing 3 and it felt like the tablet was constantly trying to slip through our fingers. Display and hardware in harmony? It's on the hardware front where Lenovo has looked to control the price, as at £249, the Yoga Tablet 10 is something of a bargain for a 10.1-inch tablet - here complete with 16GB storage and Wi-Fi capable - priced to compete with the likes of the Samsung Galaxy Tab 3 10.1. The 1280 x 800 pixel resolution display is rather limited in resolution by modern standards, as it only gives you 149 pixels per inch (ppi). Compare that to the Nexus 10's 300ppi or the iPad Air's 264ppi and it pales by comparison, but that's perhaps the price of getting something that's slightly more affordable than both. It is an IPS panel, however, and viewing angles are pretty good, so no matter which of the "modes" you're using your tablet in, it's still possible to see what's on the display. That's important, especially if you're going to be glancing at an angle in the middle of cooking or whatever else you might be doing. The display can be a little warm, making whites a little yellow, while the overall look adds in some saturation to give colours extra punch. There are three different settings for tilt, stand and hold modes that also change the display colours. Tilt seems to be the most natural overall, although the added boost to colours in stand mode seems to add punch to video. We're less keen on the palette of hold mode, which seems to boost reds too much. It's rather like the pre-set display options on your TV, but we suspect that many will pick one they like and stick to it. Beneath the surface of the Yoga Tablet 10 there's a 1.2GHz MediaTek quad-core chipset with 1GB of RAM. It's not the fastest tablet out there, with the hardware loadout again being used to keep the price down, but in the real world it performs well enough. It's quick to load intensive apps, and offers smooth playback of movies and the like. The tablet itself gets a little warm to the touch in the bottom half of the display when you ask it to perform intensive tasks, but for the most part during our testing, we found things to run smoothly enough. Our review model had 16GB of internal storage - of which just under 13GB is available for the user - or there's a 32GB option for those wanting more, as well as the option for expansion via microSD for up to an additional 64GB. The microSD card slot is cleverly hidden behind the stand on the back, with the card disappearing from sight once it is installed. Keeps everything neater and tidier. There's a 9000mAh battery stuffed into the rounded edge of the design which Lenovo says will deliver 18 hours of use. Bold claims, and qualified ones: the battery does last a long time, although its life per charge will depend greatly on what you do with it. We easily got two days from it in a mix casual games and online use, which is really good performance for a cheaper tablet. To help you get the most from the battery, Lenovo has included an app to assist called Power ManagerHD. This will give you a number of options to manage different modes and show you the estimated battery you'll get as a result. It's similar to any number of apps available in Google Play, but we welcome its inclusion, as it nudges those who might not know their way around the settings menu to be able to easily select those options to help prolong battery life. The Lenovo Yoga Tablet launches on the Android 4.2.2 operating system, which brings most of Jelly Bean's goodness - that candy-based name being the generic term for Android version 4.1 to 4.3, ahead of KitKat 4.4's launch - but there's the notable exception for multiple user profiles. That's coming, but you'll need Android 4.3 and we don't know when the Yoga Tablet will receive this update, which is already available on some smart devices. READ: What's new in Android 4.3 Jelly Bean? However, Lenovo hasn't just left Android in its raw form, it has tinkered in a number of areas, changing the look. It's not hugely offensive, although we can't help feeling that the user interface has been softened and made to look slightly less sophisticated than in its stock form. In many cases, it's only really the app icon that has changed with the app behind otherwise looking much the same as the stock Android. One of the immediately obvious changes is the removal of the apps tray, so all your apps are just dumped on to the home screens. From here you can arrange them in folders and move things around to make things easy to find, but we suspect that Android smartphone users will think that the lack of apps tray is slightly messy. We do. You can keep adding pages if you're a fan of widgets, pushing your apps pages to one side to give you space so it's not a huge problem. We found it maxed out at 18 home screens, although it seems unlikely that you'll fill that many up with app downloads, widgets or anything else. The quick settings icons have also all been changed and look a little soft and plump, but Lenovo has included controls for the Dolby sound tweaks, as well as to quickly access those different mode settings we mentioned. There are a number of bundled apps to tackle basic tasks like file management along with Norton Mobile Security, Kingsoft office, Route 66 navgiation and the battery app. Route 66 will require you to have an account if you want to use it, although all the normal Google apps are in place too and ran without a hitch. Lenovo has made a tweak to the video player giving you pop-out video, so you can be watching something whilst browsing the internet for example. Another tweak in the video app is that you can access on-screen volume and brightness controls to quickly make changes when watching a movie. Also sitting in the quick settings menu is a toggle for Dolby sound. With twin front-facing speakers, the Yoga Tablet sets out to give you a better audio experience than is typical but, unfortunately, it misses the mark. It's not as capable as the Kindle Fire's offering, it's easily outclassed by a smartphone like the HTC One or One max and the Nexus 10 even manages to give you richer bass. But it's not all bad. The location of the speakers mean they fire forward and there's a Dolby app so you can tinker with the output - it just seems that the speakers don't really deliver the quality you'll find elsewhere. There is some audible stereo separation, however, so in movies the soundstage sounds a little wider than some other tablets which is nice, although easily bettered by connecting a set of headphones. Why you're given the option to turn off Dolby we're not sure, because it sounds pretty poor without it. One neat detail that we like is the volume control. As this tablet will be used in different orientations, the volume rocker also switches function so pressing up always turns the volume up. On some devices this is fixed so that if you're holding it upside down, the volume rocker would then need to be pressed down to turn the volume up. There are two cameras on the Yoga Tablet, split between the front-facing 1.6-megapixel one and a rear-facing 5-megapixel offering. The front camera is useful for Hangouts or Skype calls, but the performance is pretty average - but it will give you a reasonable enough selfie if that's what you want to do. On the rear the camera is integrated into the rounded edge, offering autofocus and a range of shooting options. For example you can change the white balance and so on if you wish. This tablet is no comparison to your smartphone in the photo and video stakes, however, with low-light noise being very apparent in both photos and video, and the Full HD video offering struggling to really offer HD-worthy levels of detail. We're not that concerned, however, because the number of times we've used a tablet to take photos we can count on one hand. You're much better off using your smartphone, or indeed a proper camera to take snaps. The Yoga Tablet has the standard camera goodies for relevant app-based tasks, but that's as far as it goes. 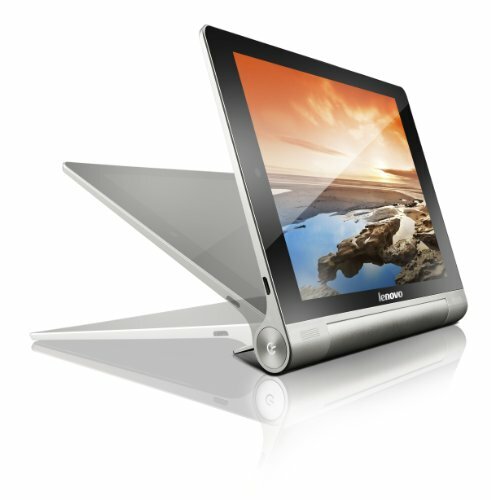 The Yoga Tablet isn't just an orphan product: Lenovo is adding to the family with some accessories. Aside from a range of covers, there's the Bluetooth Keyboard Cover that is likely to be of interest. It follows the trend of a number of manufacturers in making bespoke accessories for devices. It costs €99 on the continent, $70-80 in the US, but there's still no UK price at the time of writing. You could use a generic Bluetooth keyboard, but having one that will magnetically fit over the display as a protective cover adds to the appeal and provides extra design synergy between the two parts. The Bluetooth cover has an internal battery that's needed to power the Bluetooth connection to your tablet, although it has a bespoke charger to power it - so if you want to use the keyboard then that's another cable you'll need to carry. The keyboard is thin and lightweight, perhaps a little too lightweight as there's a lot of flex to it. The key action is pretty good though, so if you have to knuckle down to some word processing in Google Docs or Kingsoft Office, this will certainly beat using the on-screen keyboard. We don't think the design is quite right however. The tapered leading edge of the keyboard might look nice, but as soon as you apply any pressure to it, such as resting your palms on it as you type, then the back of the keyboard will flip up. It needs a couple of rubber feet on the front to stop this happening and performance will depend very much on your typing style. The Lenovo Yoga Tablet tries something a little different and to a certain extent it succeeds. This is a tablet that offers multi-mode use without the need for an additional cover, so it's a nice and clean solution. People we've shown it to have found the stand a convenience and the device itself comfortable to hold thanks to the design. There are things to criticise too however: there are more powerful tablets out there and there are lighter tablets, but what the Lenovo Yoga Tablet does is blend its unique functionality with a price point that's competitive. The chipset might not be the latest from Qualcomm and there could be more RAM to improve the performance, but this tablet still runs all the apps we want it to without a problem. The battery life is good and it's plenty responsive, so there's little to complain about on the performance side of things. However, the biggest Yoga Tablet compromise is with its display. That's where you really see the difference from other, better, tablets. The 1280 x 800 pixel resolution feels a long way from the sharp displays you get elsewhere. The 8-inch Yoga Tablet doesn't suffer the same fate as it's cheaper and sharper, offering the same resolution on a smaller panel for better overall visual. In summary, the Lenovo Yoga Tablet offers a lot for its price and is a unique proposition that will have some appeal. If you're after the best tablet on the market then you can get better specs on a smaller device like the Nexus 7, but you can't deny that the Yoga Tablet is reasonably good value for money and a welcome take on the tablet concept.